Revel in the joie de vivre of Paris! Je Suis. PARIS, the boutique travel company specializing in guided vacations for women, unveiled its latest tour to Paris tailored for baby boomer women. 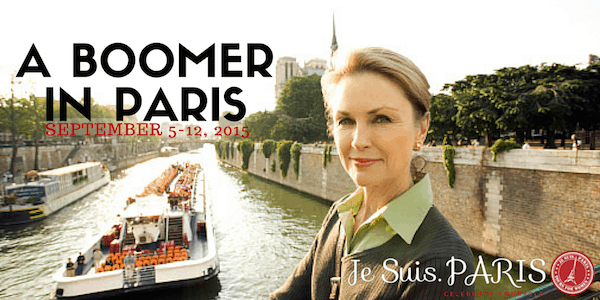 Departing September 5, 2015, the weeklong A Boomer in Paris tour has been carefully crafted and curated with the women of a certain age in mind. “Our intent for this trip is to offer boomer women a chance to discover the magic of the French capital and enjoy an insider experience filled with world-famous sights, delectable cuisine, incomparable wines, and unforgettable cultural interactions. As the dollar continues to strengthen versus the euro, now is a good time to travel to Paris and take advantage of the plummeting exchange rates,” said Raquel Segura, tour leader and President and CEO of Je Suis. PARIS. Co-hosted by travel writer Catherine Sweeney of the popular blogs Boomer Women Travelers and Traveling with Sweeney, this unique itinerary provides an in-depth look into Paris’ world-renowned art, food, history, and culture. Over the course of the trip, guests will visit some of the city’s most iconic landmarks and locations as well as lesser-known sites in VIP style. In addition, guests will enjoy a fun-filled day trip to the Champagne region, take a cooking class, spend an exquisite morning going back in time to the haunts of the literary greats with a world-renowned author, and much more. Catherine is a vibrant woman of the baby boomer generation with a passion for travel, near and far. On her blog Traveling with Sweeney she aims to inspire others by sharing compelling photos and stories that highlight the best of destinations, food, wine, history, culture and the arts. Catherine is also the founder and editor of Boomer Women Travelers, a collaborative website where travel enthusiasts of the baby boomer generation share their stories and tips from their travels around the world. For further information about A Boomer in Paris, visit Je Suis. PARIS or call 1-888-746-0836. This trip sounds tres fantastique! I thought so too! Catherine is a friend and colleague. Hi Laura, Paris is wonderful destination for women and especially a great girlfriend getaway. Plus the euro is at an all time low making it very affordable to Americans. If you decide to change your mind, I can certainly assist you in finding good airfare. Like Cathy said, if you mention Traveling with Sweeney when you call you get a discount. Thanks, I’ll keep that in mind. My BFF and I want to go together.